The weather was absolutely appalling but the work goes onBHG 14.10.18: Today the Black Hand Gang had been asked to provide safe means of access for the civil engineers of Tîm S/The S Team who undertake surveys of the railways’ bridges. 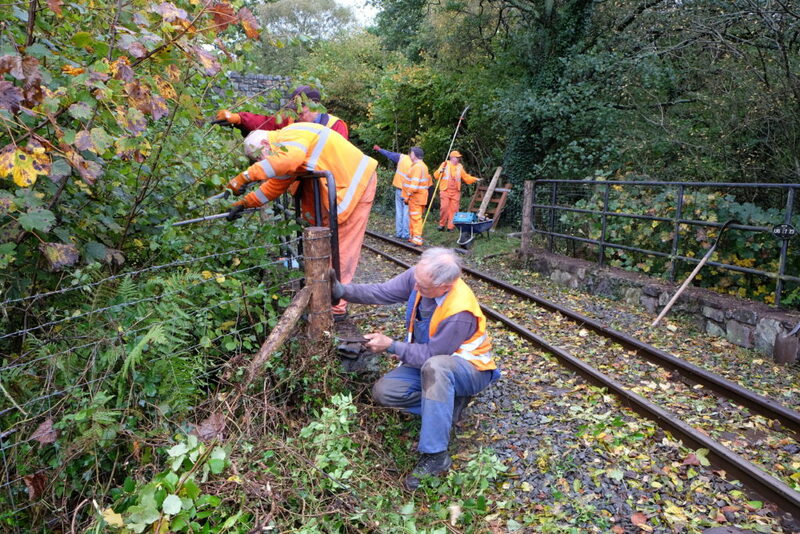 The work involved installing a gate in the fence close to two bridges, one at Cae Moel and one at Tryfan River Bridge. We were also tasked with clearing vegetation, mainly ivy, that had grow over much of the structure of Tryfan River Bridge. After Saturday’s deluge the sun shone for us on Sunday, making the job much easier. Dafydd Thomas. 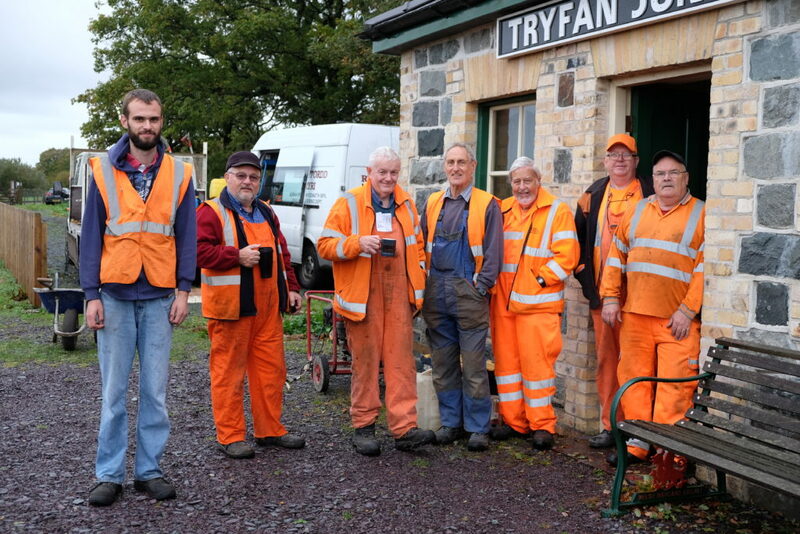 The Magnificant 8 – tea break at Tryfan Junction – No 8 is behind the camera! 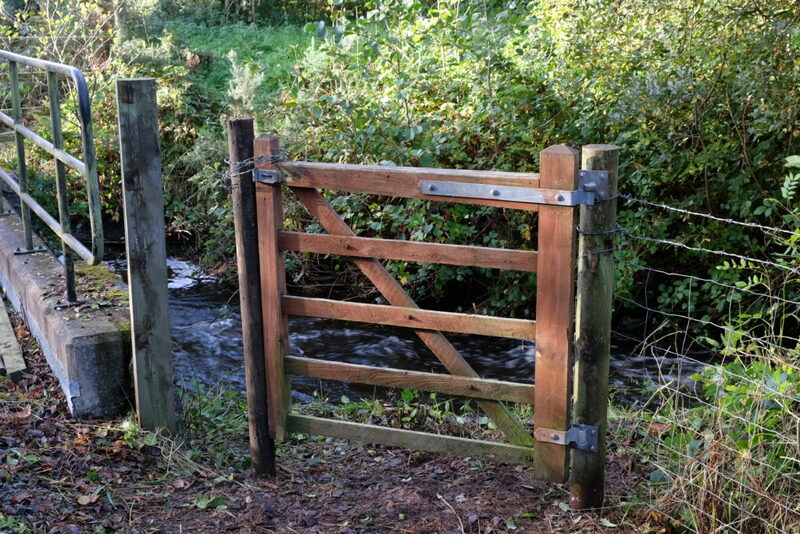 What a difference a day makes – river bridge near Caer Moel with the installation of the access gate – interesting temporary fastening. 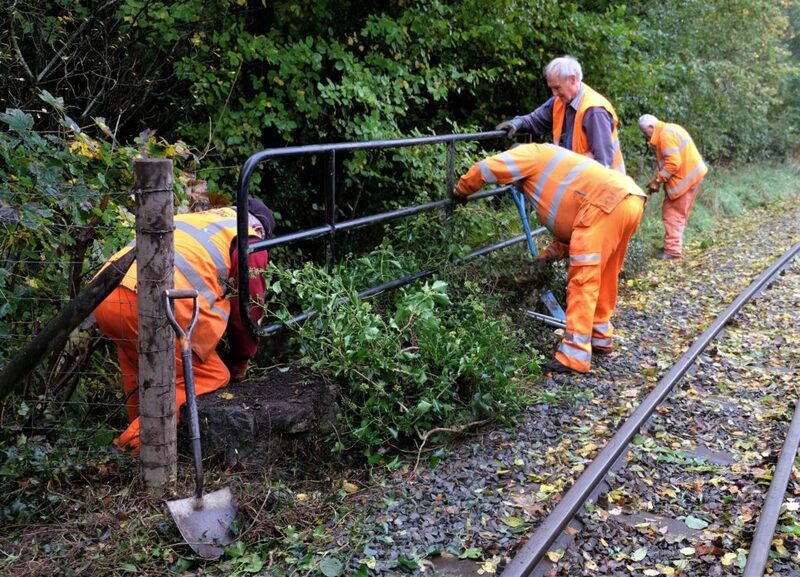 Great work as always keeping those pesky brambles and bushes from scratching paintwork on the carriages and making life easier for The S Team to check out the bridges. Warmer than anywhere in Spain, Portugal and most of the Med! The temperature has dropped a little recently with a gentle sea breeze kicking in but still very pleasant. Due to the gorse fire above Blaenau Ffestiniog. The A470 is currently closed along the High Street between our Station and the Commercial Roundabout. Ffestiniog Railway Services are currently unaffected by the fire, however we STRONGLY advise passengers to commence their journeys from Porthmadog instead. We therefore regret that Footplate Rides at Porthmadog Harbour Station will finish at 12:30 this afternoon. Following last year’s success, the popular ‘Starter Package’ is again available and costs £15 which covers the weekend entrance fee, a 2019 Limited Edition Festival Glass, and a choice of [a] 5 beer [b] 4 cider [c] 2 wine or [d] 5 soft drinks tokens - offering a saving against the ‘on the door’ price. Friday / Saturday: Weekend Ticket - £10 with Limited Edition Festival Glass (subject to availability) or £7.00 with a plain glass tankard. Sunday Only: £3.00 including plain glass (limited beer choice available). 12:00 - 15:00 : Open Mic session with FREE entry to musicians willing to play/sing - includes a FREE half-pint per performer..! Wines & Soft drinks also available. • Bus A: Waunfawr, Rhyd Ddu, Beddgelert Forest Campsite, Beddgelert, Nantmor, Aberdunant Hall. • Bus B: Groeslon, Penygroes, Garndolbenmaen, Penmorfa, Porthmadog, Minffordd, Penrhyndeudraeth. Ffestiniog & Welsh Highland Railways Ffestiniog & Welsh Highland Railways is attending an event at Galeri (Caernarfon). The Ffestiniog and Welsh Highland Railways are proud to Support Canolfan Gerdd William Mathias and the Welsh Harp Festival taking place at the Galeri in Caernarfon this evening. UPDATE >>> 'Linda' now confirmed as the footplate loco in Porthmadog..! With the Bank Holiday weekend just a few days away, we've arranged footplate rides as an Easter treat for our visitors. 🚂 BLAENAU FFESTINIOG - 'Palmerston' will be giving footplate rides in the station (between 11:00 and 16:00) as part of the 'Good Friday Easter Fun Day!' in the town. 🚂 CAERNARFON - 'Hugh Napier' will be giving footplate rides in Caernarfon station between 10:30 and 16:00. 🚂 PORTHMADOG - 'Linda' will be giving footplate rides from the end of Platform One between 10:30 and 16:00. Copyright Festiniog Railway Company	Powered by WordPress and Donovan.